Give the gift of USGladius® this holiday season! Receive the War Galley™ XII Titanium Marine and your choice of the Desert Legion™ XII or Thraex™ XII Tactical plus two USGladius® accessories. This knife is made of solid titanium with full tang construction, built for rugged use and abuse. Corrosion resistant, its home is the sea. This is a great companion piece for water adventures as well as tactical and survival purposes. 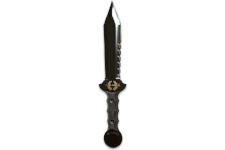 The Thraex™ XII Tactical is the original USGladius®, named after the Thracian style of gladiators. This knife features a full tang titanium-coated stainless steel blade with micarta handles, a serrated edge, and tactical sheath. The Desert Legion™ XII comes with a double-edged full tang titanium-coated stainless steel blade. This knife features removable handle scales for reduced weight, easy cleaning, throwing, survival applications or to use with a lanyard. Also check out our Ultimate Christmas Bundle! Give a practical tactical gift this holiday season with The Ultimate USGladius® Christmas Bundle! Experience the full journey of the USGladius® line with each of our four tactical knives and choose three USGladius® accessories as well.